The Big Manistee River from Tippy Dam to Manistee Lake offers approximately 25 miles of water. Fishing below Tippy Dam is an experience unlike any other river in the Midwest. While fishing below Tippy Dam an angler is likely, depending on timing, to encounter and of the following species of game fish. Steelhead, King and Coho Salmon, Lake Run and resident brown trout, Walleye, Pike, smallmouth and largemouth bass. An angler could spend a lifetime fishing below Tippy Dam and never learn all of its nuances and moods. Beginning at the Dam the river for the first couple of miles is mostly a big riffle. The bottom is dominated by gravel, a lot of it spawning gravel. As the river gets closer to High Bridge access the velocity slows down, there is less gravel and large amounts of large woody debris. These characteristics continue downstream to Manistee Lake. Due to the large numbers of migratory species (see above) fishing below Tippy Dam varies in tackle and techniques substantially during the year. Let’s look at it month by month. Fishing below Tippy Dam in January and February is mostly a steelhead thing with some trout available close to Tippy Dam. Steelhead are hooked this time of year primarily on egg patterns with some taken on the swing using two-handed rods. Trout fall prey to both nymphs and streamers winter fishing below Tippy Dam. A 250 grain sink tip on a seven weight rod can be deadly. 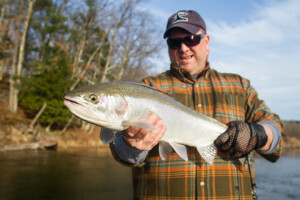 As March and April roll around the water warms and steelhead spawning activity begins to ramp up. Spring steelhead run is on the way! The resident browns are gobbling up the steelhead eggs and looking for both the walleye and suckers to start contributing to the food source by spawning too. This is a period of lots of activity fishing below Tippy Dam. With the majority of the spawning gravel with in a couple miles of the dam, fishing pressure in this section can be intense. Spring is also prime time for pike fishing in the Big Manistee. Many of the backwaters hold good numbers of pike and when the water starts to warm they will move to the mainstream looking for food opportunities. The good news is that these areas aren’t up by the dam so when fishing below Tippy Dam in spring this is a good option for anglers looking for a little solitude. Fishing below Tippy Dam in May and to a lesser degree June is dominated by the resident trout near the Tippy Dam. The DNR plants over 20,000 brown trout at the dam every year. This creates an artificial but great fishery as these fish grow quickly and are concentrated in large numbers. Due to the rapid growth there are holdover brown trout in this water that will exceed five pounds. In addition there is an underutilized fishery for drop back steelhead. After steelhead spawn they start to make their way back to Lake Michigan. They don’t necessarily just swim down river, they can hang around and just start acting and feeding like resident fish. As summer kicks in and the water starts to warm fishing below Tippy Dam offers quite a variety. There are some summer run steelhead to be had at the coldwater sources. 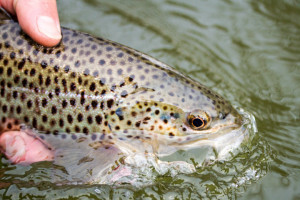 Trout fishing is still viable up by the dam with dries, nymphs and soft hackles. But most years the star of the show this time of year is the smallmouth bass. As the water warms the bass move in and provide great sport to the fly angler. These hard fighting game fish can be caught on poppers, floating baitfish and streamers. These fish can be caught consistently until the salmon show in decent numbers. Beginning in August King Salmon start their annual migration up the Big Manistee River to spawn and complete their cycle of life. The most exciting way to catch these fish is when they first move in. When fresh is the river these salmon will kill a streamer and provide you with an incredible battle. As they move closer to the gravel their focus turns from feeding to spawning and catching them becomes more difficult. October, November and December the fishing below Tippy Dam is incredible. Fall run steelhead are moving in. These fish are renowned for their fighting ability and beauty. Every one of them is a trophy. The Big Manistee is widely considered one of the best, if not the best steelhead river in the Midwest. In addition to steelhead lake run browns make their appearance in fall. The Big Manistee currently holds the all tackle world record for brown trout. That fish weighed in at 40 plus pounds. All of this is happening in the entire length of the river so the fishing pressure is spread out making it an enjoyable experience. Fall and early winter also provide with the opportunity to capitalize on the resident trout fishery. These fish are fat and happy after the egg diet they have just experienced. They are big and heavy and looking to add to that weight before water temps drop too much. That’s a brief overview of fishing below Tipp Dam. It’s a world-class venue with terrific variety and great scenery. 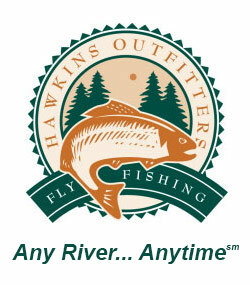 I hope you will plan a couple of days with Hawkins Outfitters to experience fishing below Tippy Dam. It’s a trip you won’t soon forget.